Janie: Last Friday, we discussed two middle grade novels that were filled with sadness. Today we turn to a couple of sports-related novels by authors who have already been generously recognized by the American Library Association. In fact, Kwame Alexander won the coveted Newbery medal two years ago for his basketball-related verse novel, The Crossover. We were very fond of The Crossover ourselves! Alexander’s Booked is similar, in that it’s a first-person narrative in verse format. The sport is soccer this time, not basketball, and the main character’s race is not apparent. Family dynamics, as in the previous book, are the main driver of the narrative. Nick Hall loves Soccer, pizza, and (if he’ll only admit it to himself), April. He hates books and, by extension, words. It’s just his luck his dad is a verbomaniac, and has even written a dictionary called Weird and Wonderful Words (the reader of Booked will learn a lot of them, like verbomania). Nick’s best friend Coby is true blue and his mom is ready to match ping pong paddles with him any time. But he can’t help noticing his parents are fighting more, and when they announce that they are separating—and his mom is actually moving away!—the bottom falls out of his life. Soccer provides some consolation, but even that’s complicated by Dad’s stubbornness and an unexpected health crisis. 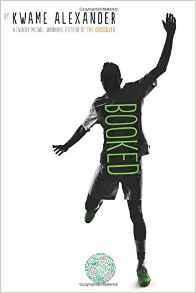 Booked is a quick, engrossing read, with several striking passages and relatable humor. Alexander has a gift for understanding kids at this age, and I appreciated his treatment of Nick’s parents’ possible divorce. We hear his parents’ explanation, but it doesn’t make sense (and boy, does his mom make me mad!). This is how children experience divorce, while the grownups are trying to pretend that everybody will quickly adjust to a new normal. But what about the title? As a grownup and reader of children’s novels, as soon as a character says he doesn’t like books or reading, I know there’s likely to be a conversion coming up. (The one exception I’ve seen is Charlie Joe Jackson.) How do you think the benefits of reading are handled, Betsy? Betsy: Oh, Janie, you’re so right—the conversion-to-book-lover theme happens in many children’s novels, and to me, it screams of a book that is written for teachers and librarians to foist on their unwitting students. I did like that Booked featured a character who wasn’t so into books, despite his dad’s propensity for big words. And the big words are fun to learn as a reader. And yet, not all book-haters turn into book-lovers. And not all librarians are super hip, cool rappers. And books are worth reading even if they aren’t being pushed by a super hip, cool rapping librarian! This particular angle reminded me of the undercurrent that runs strong in the secular children’s lit world: books save. Reading saves. But only Christ saves. We can be godly Christians who don’t enjoy reading. Our children can be growing in their faith, learning to know their Savior better, without turning into bibliophiles. Undoubtedly, people draw encouragement from reading about people in their situations or who struggle with similar things, and I do think children who’ve experienced divorce will resonate with Booked’s treatment of it (particularly that the parents aren’t back together by the end of the book). But that’s a surface encouragement without Christ. Ghost is a similar novel in that it handles unrest in the family (Castle’s dad is in prison, and his mom is barely making ends meet) and is a “sports novel.” But I think it the stronger of the two thematically and artistically. Why don’t you tell us a little about the book, Janie, before we jump into the nitty gritty? Janie: Well said about book “conversions.” I suppose that people (like us!) who build their education and livelihoods on literature can sometimes give books an exaggerated importance. 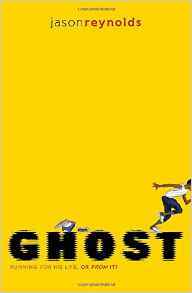 There’s none of that in Ghost, the first in a series about a neighborhood track team, built on the author’s own middle-grade experience. “Ghost” is the preferred nickname of the main character, Castle Cranshaw, an at-risk kid with “a lot of scream inside” because, as you mentioned, his emotionally-unstable father is in prison and his overworked mom can’t spend much time with him. As in classic stories of this type, he encounters a mentor who’s willing to stick with him, and by fits and starts he finds a purpose and a goal. We gave Ghost a starred review at Redeemed Reader because it shines in all the basic elements of a good children’s novel: sympathetic characters, swift pacing, touches of humor, and a strong moral core. I especially like the way the central challenge is handled, when Castle/Ghost makes a bad choice (that’s the world’s terminology; we call it sin) and, when he’s not caught right away, manages to square it with his conscience. This is a subtle reminder that kids need direction; they’re not self-contained moral compasses who will find their way on their own. So Betsy, tell us why you think Ghost is a stronger novel than Booked. Betsy: Personally, Ghost was one of my favorite reads this year. It might be my own nostalgia for my middle school track days that influenced my opinion, but that’s part of the charm of this book. Reynolds has a real gift for capturing the voice of his characters, and Ghost is no exception. Track details, the middle school “feel,” and conscience tensions are spot on. Booked handled this same area pretty well, but Ghost takes it one step further. Rather than a cool, hip librarian with pithy statements, the adult helper in Ghost is a coach with tough love. He doesn’t expect Castle/Ghost to solve all his own problems, but he certainly expects him to step up to the plate and make restitution. That might be running extra laps to pay Coach back for bailing him out of a school suspension or cleaning out Coach’s car in return for Coach sticking his neck out for him. In other words, actions have consequences, even when grace intervenes. That’s reality. Thanks to the grace of the Lord, I will not pay the full price for the (many) sins I’ve committed; since I’m a sinner, I will always sin. BUT, even though I might not ultimately suffer the full price for my sinful nature, I still have to face the real world consequences in the here and now—some of those are mitigated through the Lord’s grace, some are not. If I speed (break the law), I get a traffic ticket. Thus, Ghost offers us a more realistic picture of life itself: life is hard work, but thankfully, there is grace. Thematically, therefore, Ghost is a much stronger novel than Booked. Janie, one thing we haven’t really touched on is that both of these books are about African American characters and families. I think it’s encouraging that we’re seeing more novels with characters of color that aren’t simply “race-relations” novels. Instead, these are ordinary kids in ordinary situations. Their race is not irrelevant, but neither is it the driving force of the plot. As we close, are there other titles you’ve read this year that are similar: they feature diverse characters, but the story itself is not solely about race? The two titles I reviewed for 9/11 this year certainly fit: Nine, Ten and Towers Falling. Janie: Thinking back on Booked, I don’t remember that Nick was even identified as black. I think a lot of reviewers assumed he was, because Kwame Alexander is, but to me race wasn’t a factor at all. One thing I like about Jason Reynolds is that race is a factor in his novels, but his themes are human themes. When I Was the Greatest deals with disability, sibling rivalry, guilt and forgiveness in a black context, but any young reader should be able to relate. It Ain’t So Awful, Falafel features an Iranian girl in America whose main struggle is fitting in. Her nationality is the main issue, but most young teens struggle to fit in for various reasons. So I agree; I think this is an encouraging development. And it’s great to be able to discuss two books with no objectionable content.